Periodically getting a fix of a dish I adore is something I’m used to (the black cod and ginger dim sum at Plum Valley in London’s Chinatown being a prime example) but this cod and sausage dish is just too darn nice to eat infrequently. And unlike the magic required to pull off that (oh-my-god-I’ve-died-and-gone-to-heaven) glutinous white dim sum pastry, with a little bit of time and sourcing of the right ingredients it’s rather easy to pull off this Italian fish dish. So recreate it at home I can – and at a fraction of the cost of the restaurant version it’s inspired by. To make it you could use a good quality shop bought gnocchi (such as De Cecco), but making your own doesn’t take long and will be much cheaper and more satisfying (cue smug points), especially if you make them in large batches and freeze them in portions for use at a later date. I used a cute little gnocchi ridger to roll little balls of the dough down to form fat ridged dumplings, but if you don’t have one of these simply use the back of a fork to create the dents – they’re important for helping the sauce cling to them as well as adding extra visual interest. Hunting out the nduja sausage might be tricky, but it really packs a punch and a little goes a long way. It’s a fiery Italian sausage with a texture like a pate. If you can’t find it, you could substitute it for a good and fatty chorizo, sobrasada or other fatty continental sausage good for cooking, you only need a little. I cooked it just briefly until it melted, rendering its hot orange fat over the base of the pan, added a generous knob of unsalted butter and when it began to foam, gently fried the pre-simmered gnocchis until lightly crispy and deliciously chewy. The centrepiece of the dish is the fish. Now, a thick piece of cod is not only pricey, it’s a fish we need to eat less of from a sustainability perspective. But what to switch it for? This time I chose to use pollock, and the result couldn’t have been tastier. Pollock is a fantastic and underrated fish. Its flesh is dense and meaty and unlike cod (in my opinion) it has real flavour; sweet and of the sea but not ‘fishy’. Its flakes are wonderfully large, its skin crisps easily and it’s affordable. What’s not to like? Give it a go if you haven’t already. Finally, to bring these three ingredients together and to dress the tenderstem broccoli I made a very simple tomato vinaigrette, warmed it acts as a clean and vibrant dressing. It’s a mixture of chopped fresh tomatoes, garlic, lemon juice, a little sugar and extra virgin olive oil. It works well here in cutting through the fire of the sausage and the comforting denseness of the gnocchis, and really brings out the sweetness of the fish. It’s a great base for baked fish of all kinds and a good one to know if you’re ever short of ideas. This dish really does have it all. Deliciously balanced flavours and textures, easy and fast to cook and to top it off it looks great. It would be ideal for a dinner when you have friends coming over, maximum taste and wow factor without having to be a slave to the stove all evening. A winner in my book. Start with the gnocchi. Preheat your oven to 180°C. Boil your potatoes for around 10 minutes until they are just tender, don’t let them get over boiled as they’ll be too wet to use. Drain and place on a baking sheet and let them steam off for about 10 minutes, then place them into the hot oven for 5 minutes to get rid of more moisture. Rice or mash them into a bowl – if mashing make sure it’s very smooth. Sprinkle over the salt and pepper and run through with a fork. Drizzle the egg over the top of the mixture, followed by 3/4 of the flour, and using a metal spoon mix together, incorporating as much flour as you need until you’ve got a crumble-like texture that’s not wet. Turn it out onto a work surface and bring it together, kneading lightly and only for a minute. 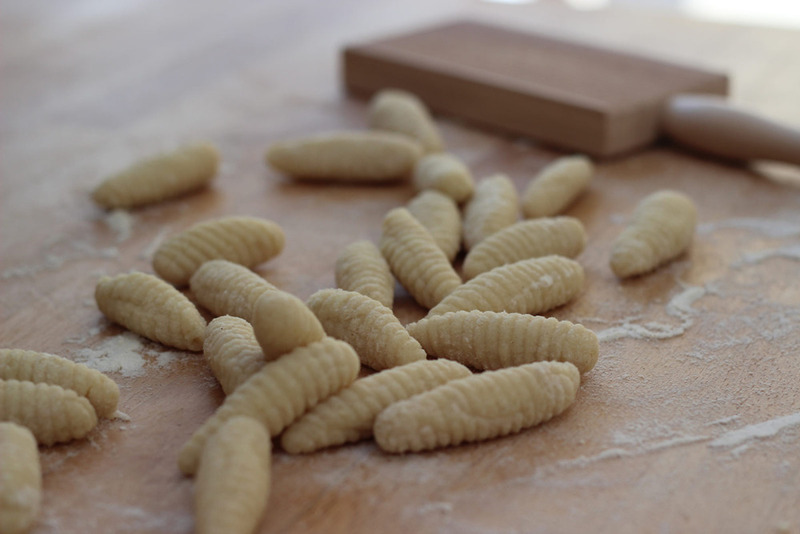 If using a gnocchi board, break off a piece the size of a cherry and roll it down the board with the board stood up, creating long gnocchis as in the pic (super easy and dead satisfying!). 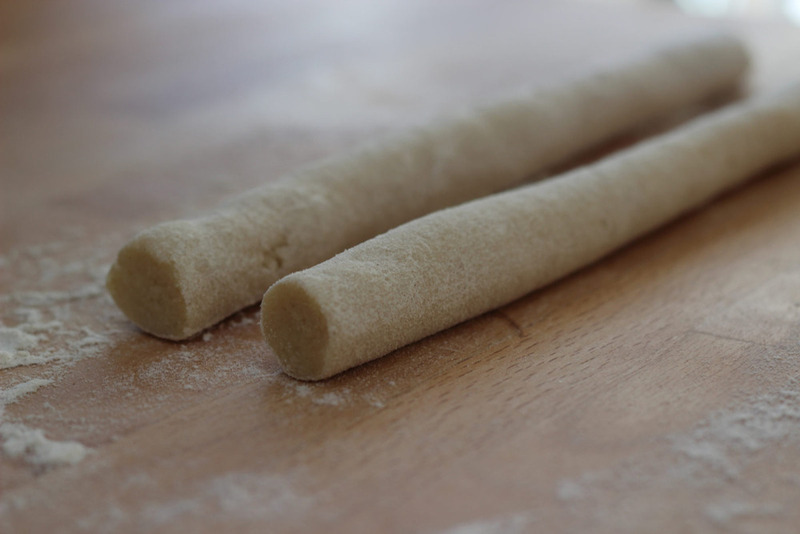 If not using a gnocchi board, break the dough into 4 pieces and roll each out in turn into a sausage, then cut into gnocchi sized dice, pinch each one at its top and bottom (so it looks like a plumped pillow) then press the top with the back of a fork to create the grooves. Repeat until all have been made. Lay them on a lightly floured baking sheet and dust with a little more flour, cover with clingfilm and place into the fridge until they are needed later. Finely chop the tomatoes and put them into a small put with the garlic, a slug of extra virgin olive oil, lemon, sugar and a scrunch of sea salt and pepper, put onto a very low heat with the lid on and let the flavours infuse. Bring a pan of salted water to the boil and when rolling add the gnocchis, stir them to make sure they don’t get stuck together and after about 2 minutes (but not longer) when they are floating in the pan drain them. Take the drained gnocchis and put them onto a plate, make sure they aren’t touching. Set aside. Bring another pan of water to the boil for the broccoli. Add a few tablespoons frying oil to a frying pan with with a large knob of unsalted butter and heat on a high heat. Take the pollock fillets and salt their skins, and when the butter is foaming place them into the pan skin side down. DON’T MOVE THEM! Let them sit there untouched for 3 minutes. After 3 minutes put the broccoli onto boil, season the other sides of the pollock in the pan and turn them over. Cook them for another 2 minutes (after 2 minutes you are to tun the heat off and let them sit there to cook through in the residual heat) and after 3 minutes the broccoli’s should be ready to drain. While the broccoli and fish are cooking, add the nduja sausage to another frying pan on a high heat, when it starts to render add a large knob of unsalted butter. Mix these together in the pan and tip in your gnocchis – shake them in the pan to coat them in the sauce and to get them cooked again. 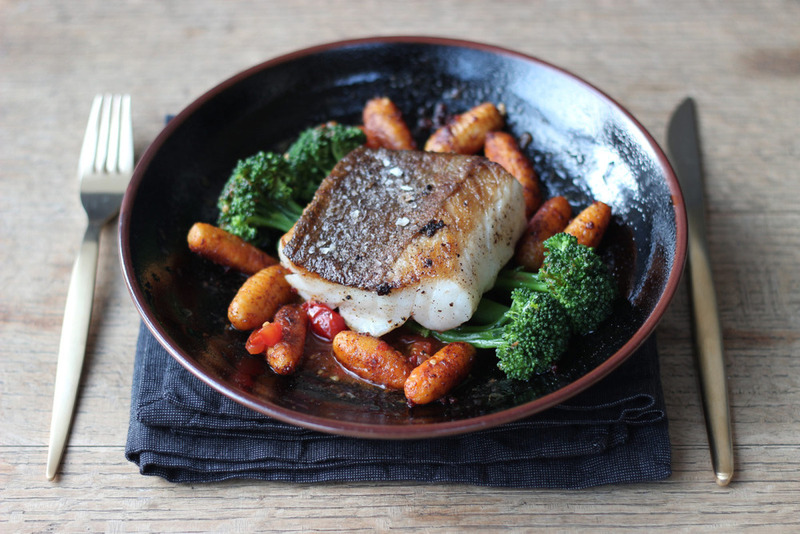 To plate take your drained broccoli as your base, top with the fillet of pollock and then dress the outside of the plate with the warm tomato vinaigrette. Finally, add the deliciously chewy fried gnocchis around the edge. Give the fish a scrunch of salt and you’re done.